When I read a cookbook, there are always recipes that stick in my mind, that I continue to think about for weeks. When they're recipes for things that aren't in season at the time, I make mental notes about what future occasions would be good opportunities to serve each particular dish. 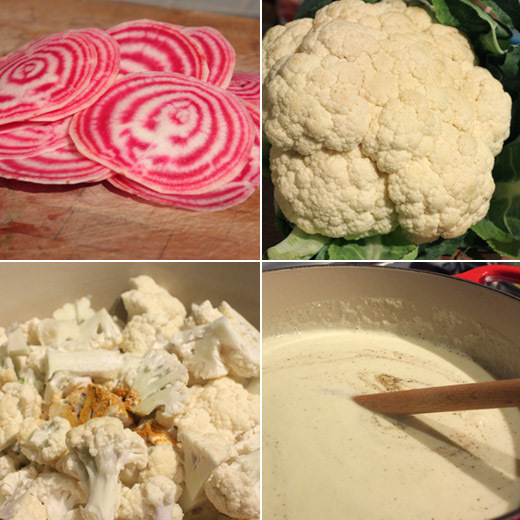 So, last year when I read Ad Hoc at Home and saw a lovely looking cream of cauliflower soup with beet chips, the winter vegetables and red and white colors made me think of Christmas. This being a Thomas Keller recipe and my first time trying this recipe, I didn't want to be making this on the actual day of Christmas. Instead, I chose a day during the holiday season when I had plenty of time to work my way through each step, use each and every pot, pan, and utensil I own, and then wash all of those dishes after dinner. Yes, it is a little bit of a process to follow the recipe exactly, but it all came together nicely to make a velvety smooth soup with crispy, crunchy, and tasty toppings. The first step is to chop the cauliflower. Most of the cauliflower, including the stems, were cooked and pureed, but some florets were set aside for a garnish. For the puree, onion, leeks, coarsely chopped cauliflower, and some curry powder were cooked in melted butter. Equal amounts of milk, cream, and water were added, and it was left to simmer until the cauliflower was tender. The mixture was pureed in batches. To make things easier on the day you plan to serve the soup, this puree could be made in advance and just re-warmed before serving. Next, a red beet was peeled and thinly sliced on a Japanese mandoline. I used a candy cane striped chioggia beet from our farmers' market. The paper thin beet slices were fried in oil in a small saucepan and left to drain on a paper towel-lined rack. Then, the reserved cauliflower florets were blanched in water with a little vinegar. Keller notes that the vinegar helps keep the cauliflower white. The drained, florets were then sauteed in melted butter. At the same time, I also made the requisite torn croutons which were slowly browned in a mix of garlic oil and melted butter with the goal of the croutons absorbing the flavor of the oil and butter while taking on a crisp outer texture. The soup was served in wide bowls topped with the florets, then some torn croutons, a stack of beet chips, and a swirl of extra virgin olive oil. The other garnishes held the beet chips up and out of the soup so they stayed crisp. All of the parts and pieces did make a spectacular soup. The rich and smooth puree was even better with the chunky and crunchy textures of the garnishes. Certainly, the soup puree could have been made in advance, but the beet chips are best when just fried and still crisp and warm. The croutons can be re-warmed, but they do become drier and lose the bit of give they have after just being browned. This soup was a great example of how simple, humble vegetables can become a dish that's the star of a meal. I am like you, I am a huge collector of cookbooks. However, it seems that I am unlike you in that I barely ever read them! I'll flip through them when I first get them, and reference them every so often... but I hardly ever sit down and READ them. I should though, I am spending a lot of money on them and there is a whole library of information in there. Oh, how wonderful! That soup must be very tasty. The chips are so pretty. A gorgeous soup. I love the addition of the red beet chips! Wow. Your photo just makes me crave this soup, and I can honestly say that's a first. :) Sounds delicious and looks perfect. That is one amazing photo. I love the creamy light coloured soup and the dramatic red crisps, simply beautiful. I'm a pushover when it comes to cauliflower. Love the stuff. And those beets look gorgeous! Such stunning color and presentation. Bravo! Happy new Year Lisa ! nothing is more satisfying than enjoying a meal for which you have been toiling hours for. This is definitely one of those meals, and not to mention, how wonderful all those cauliflowers are for you! Beet chips are genius! I can think of lots of ways to serve those! And who doesn't luv a creamy cauliflower soup? Cheers to the season of soup! Happy New Year to you and your family! I had a little trouble making the chips, some did not "fry right", but I had enough cute ones to serve a couple of bowls... wonderful soup indeed! The beet chips make a beautiful garnish. I bet this soup is super smooth since just pureed cauliflower is so velvety all on its own. This sounds amazing and if my children ate cauliflower I would certainly attempt to make this delicious soup. The cauliflower soup sounds and looks heavenly! Beet chips :-))) I simply love the idea. Thanks, Lisa. 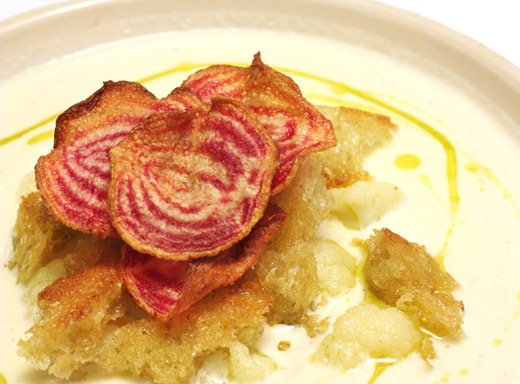 The soup looks divine on it's own but then you top it with those Red Beet Chips! Beautiful dish, perfectly executed! The beet chips on top sound excellent! The soup is beautiful. Now I see why you needed only white cauliflower. TK's recipes are a bit labor intensive but they rarely disappoint. I need to pick up Ad Hoc at Home. Your soup looks very pretty, love the drizzle on top. Happy New Year! I got that cookbook from my library - such great recipes! Love how your dish turned out. I didn't even TRY cauliflower until a few years ago, now I love it! I'm totally in the mood for a creamy vegetable soup right now. 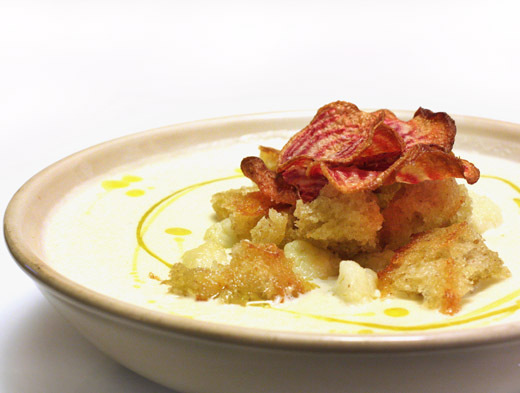 This soup really is beautiful with the beet chips! Lisa, this sounds heavenly, one of the things I'll definatly put on the menu in the cooler months, thanks for sharing. cauliflower is, i'm sad to say, one of the few veggies that i don't like. you've made it look awfully appealing, though, and i'm loving the gorgeous beet chips! Oh yes, I have a recipe that also involves cauliflower that I keep thinking about from that book. The sheer number of steps (and the ensuing dishes) is what has kept me from making it. It is nice to know that at the end of it all, there is something truly delicious waiting for you. I love the way all of the different textures and flavors play together in this dish. A treat to look at as well! What a beautiful soup and I LOVE those chips, it just makes for a beautiful presentation. I think I've mentioned this before, but cauliflower was something I used to be blase about until I had it from my CSA and then boom, I discovered the flavor. I'm imagining it as I type this. How did the cauliflower turn out so smooth in a soup? I do not have the patience when it comes to cauliflower though I am a fan of cauliflower.